The sport of flat track roller derby is booming in Alaska. The Sitka Sound Slayers got rolling two years ago and boast 29 members on their roster. But how did this former spectacle turn into a bonafide sport? Off the track, these 29 women are teachers, commercial fisherwomen and stay at home moms. But on the track, they are a force of raw female power. Their logo is a skull with crossed halibut and gaff hooks. Yes, they skate in fishnets and lipstick, but also helmets and mouth guards. Roller Derby is tough to play and addictive to watch. 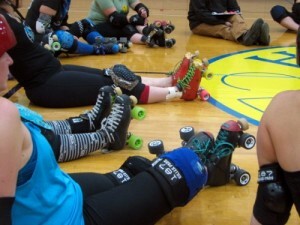 Their last bout with the Garnet Grit Betties of Wrangell sold out in five days. “I typically have very thick glasses and wear ridiculous dresses,” said Bridgette Whitcomb, a 7th grade science teacher. “I was missing athleticism in my life,” said Cori Schumejda. Schumejda played basketball in college and is now the league president. She goes by Valkori and sometimes warms up with Viking horns on her head. Players skate on a flat track, not a banked track, and safety is paramount. There’s no punching, no elbowing, no clotheslining. In other words, modern derby is not the derby you may remember from a few decades ago. According to the National Museum of Roller Skating, it all started with a TV publicist named Leo Seltzer who losing money during the Great Depression. He decided to organize these marathon skating events and sold tickets. The public loved it, even more so when players began exaggerating their falls and elbowing opponents. Seltzer tried to curtail this fake play, but it was too late. By the 1970s, Roller Derby was part-theater, part-wrestling. A raucous, rage-filled spectacle with staged fights and little regulation. In this bout between the Los Angeles Thunderbirds and the Chicago Hawks (about 40 seconds in), one skater grabs another by her collar and slings her across the track into the medical bench. And she’s not wearing a helmet. The crowd goes wild. So how did Derby go from that, to this? Juliana Gonzalez (aka Bloody Mary) is the Executive Director of the Women’s Flat Track Derby Association. In 2001, a grassroots league formed called the Texas Rollergirls. Gonzalez was one of the founding godmothers. When we spoke, she was in the locker room of Team Greece at the Blood and Thunder Roller Derby World Cup in Dallas, Texas. Globally, the WFTDA has roughly 400 leagues, representing about 25,000 athletes. Gonzalez explains that while Roller Derby has retained elements of its former self, the power structure is flipped. The female skaters run their own leagues, not an outside owner or a commercial interest. For Gonzalez, derby’s fundamental autonomy is why leagues are springing up around the world. And women in Alaska are heeding that call. There are member leagues in Wasilla,Fairbanks, Anchorage, and Juneau. In Southeast, there’s also the Ketchikan Rainforest Rollergirls and the Petersburg Ragnarök Rollers. The Slayers hope to one day join the WFTDA. But for now, they’re mostly savoring the house they’ve built at right at home. “I really love Sitka’s audience because they just come alive and it really just breathes fire into the skaters,” said Courtney MacArthur. Her derby name is Bev’ Olution, a tribute to how the sport radically changed her life. She has a tattoo on her arm of a little girl praying to a Barbie doll. Roller Derby was invented by a man. No argument. But it is definitely women who are taking it back.